241st day of the year. There were then 124 days left in 2018.
on the 35th week of 2018 (using US standard week number calculation). 70th day of Summer. There were 24 days left till Fall. 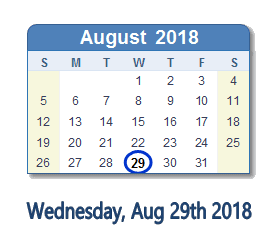 What happened on August 29th 2018? In closed-door meeting, Trump told Christian leaders he got rid of a law. He didn't.